Cycle Party is coming to Coconut Grove the first and third Saturday of each month, tomorrow, February 2 is the first. Cycle Party’s one-of-a-kind adventures takes place on a bike-type vehicle that holds up to 15 guests, it takes six, the minimum, to get the party going. You can book the entire bike to make it private or by-the-seat on one of their Social Tours. Cycle Party is sponsored by the Coconut Grove BID. This is not a drinking tour, although there are drinking tours in other areas like the Wynwood Happy Hour tour. The Grove tour is about an hour and a half and will take you on a scenic ride, providing historical facts, music, and insightful knowledge of the area. 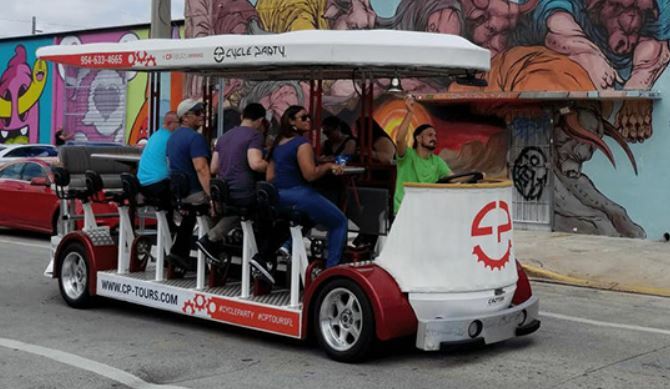 Chris Haerting and Simon Fernandez started Cycle Party almost seven years ago in Fort Lauderdale and West Palm Beach and for about year and a half, they have been operating in Wynwood. “The last six months we have been eager to start a route in Coconut Grove (my favorite neighborhood in Miami). This Saturday will be our very first tour. We plan on operating our Scenic Tour the first and third Saturday of each month at 10:30 am. Our plan is for the tour to last approximately 1.5 hours, starting and ending at the Playhouse parking lot,” says Chris. The Dr. Seuss-like vehicle is powered by pedal power – your pedal power! You have to be at least 16 years old to pedal, but kids of all ages are permitted on the Cycle Party. The Cycle Party group bike is 16-1/2 feet long, 8 feet wide and 8-1/2 feet high, and seats 15 party guests around a center table under a rooftop. The tours require a reservation, the cost is $29 per person.